Turn those fresh summer vegetables into a delicious side dish the whole family with love. 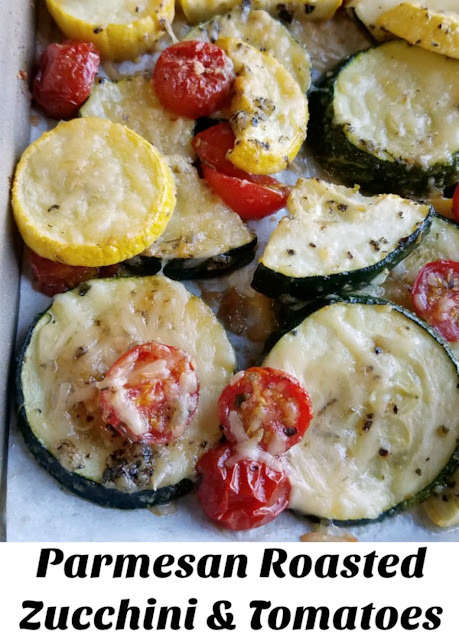 Parmesan roasted zucchini and tomatoes is simple and delicious! 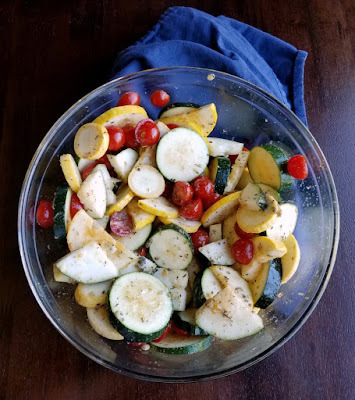 Garden fresh vegetables get a flavor kick from garlic, herbs and of course Parmesan cheese! 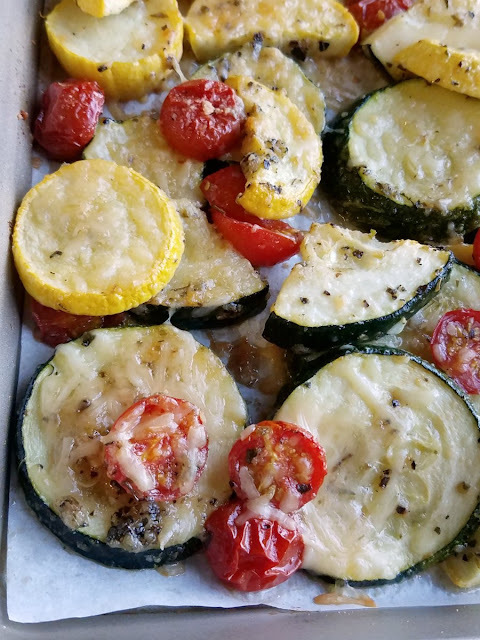 These yummy roasted zucchini and tomatoes are sure to be gobbled up at your dinner table. In fact, I think I am going to make two pans next time just so I can have some leftovers! Little Dude loves cherry tomatoes. They are one of his absolute favorites! So we have to have a plant in our garden each year. My brother starts tomatoes and peppers from seeds and is always generous in sharing plants with us. This year he had Little Dude plant his very own cherry tomato seed and let him help at all the important steps along the way. Little Dude very proudly planted his tomato plant along with a "big mama" roma plant and a slicing tomato plant for us. He was happy as a lark. Then the tomato plants did what tomato plants do for us, grew... and grew, and grew and grew! I don't know how, because we rarely feed them and usually neglect them, but our tomato plants always have a way of growing huge. My husband has really worked up a great system for keeping them contained, which is probably a large part of the reason they grow so tall. Each of the three plants get a heavy duty cage. Then another cage goes between them to give the branches lateral support. The whole thing gets wrapped in what was metal "fabric" for pouring in cement that is suspended on stakes. We lost our really big thick tomato plants to wind storms early in the season two years in a row and that was that for my husband. Now he builds them to stand up to a hurricane! All of that to say we can pick dozens of cherry tomatoes each day and still have plenty. Little Dude and our neighbor kid snack on them when then play outside, which I just love. My husband and I have the habit of grabbing one or two as we walk by as well. This might be one of my new favorite options though. We are still getting a few zucchini and summer squash each week in our CSA box. We've already had some of K.C. 's zucchini bread, a zapple crisp and summer vegetable medley (to name just a few!) So it was time to do something different with the zucchini. 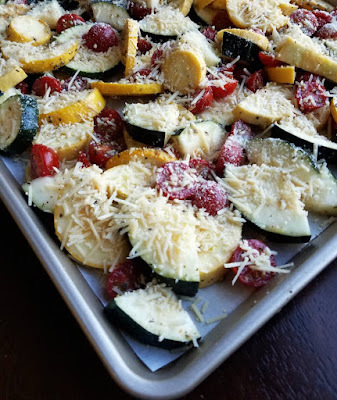 I love the flavors and textures from the Italian sausage and summer veggies sheet pan supper, so I thought I would do a twist on that to make it a side dish. Of course a nice big handful or two of Parmesan never hurt, so I tossed that on as well. The veggies came out with a great texture and loads of flavor and the melted cheese really added something. I could honestly sit down with a huge plate of this and call it dinner. Little Dude had been craving shrimp, however, so I roasted some yummy shrimp to serve with it. Oh the sacrifices we make! So next time your garden is burying you in zucchini and tomatoes, be sure to pull up this recipe. It is going to make you beg for more! 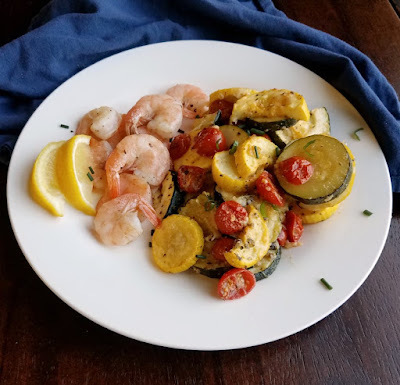 As always: If you make this recipe–or any CWC recipes–let me know what you think by leaving a comment below. And post a pic on Instagram or Pinterest too—tag @carleecooks so I can see! For more recipes and fun, like us on Facebook and follow along on Pinterest! Preheat oven to 400 F and line a rimmed baking sheet with parchment paper. Slice zucchini about 1/4 inch thick and halve cherry tomatoes. In a large bowl mix together the olive oil, garlic, oregano, basil and a healthy pinch of salt and pepper. Toss veggies to coat and let sit for a few minutes. Spread over the prepared sheet pan and sprinkle liberally with grated Parmesan cheese. Bake for 25-30 minutes. 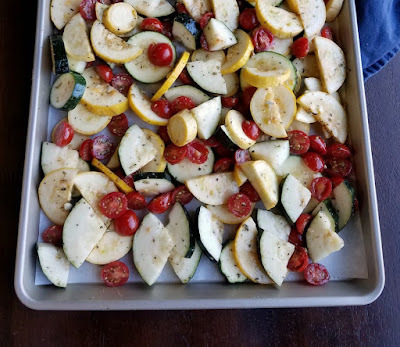 I lOVE that you put 3 of my favorite summer vegetables together on one fabulous Sheet pan side. Heck, I could almost make my dinner out of this!! YUM!! off to the farmer's stand I go!! happy Monday! I could too! We'll have to make two pans and get together! That was my inspiration; what to do with all of the veggies sitting on the counter?! A healthy sprinkle of Parm can definitely do wonders! We always have a plethora of cherry tomatoes! Love this! We do too, so it's great to have some fun ways to use them! My word those plants are huge! I'm sure Little Dude had a great time helping out with the growing process. The dish looks like fresh cheesy goodness and perfect as a side to so many things. Aren't they crazy? He is extra proud of his plant and loves getting tomato snacks while he's playing! I'd be content to have a bowl of just this for dinner. Aren't they? I think we finally have a system that we love! I'm very jealous of your tomato plants! This recipe sounds simple and delicious. We usually have really good luck with tomatoes, but these last few years we have really found a system for planting, caging and picking that we love! That melty cheese goodness makes me want to dive right in! Be my guest! It's delicious! Roasting just makes everything better! This looks awesome! THanks for sharing at our Celebrate 365 Blog Party! It will be worth the effort, I promise! This looks so good carlee! We do the same with our cherry tomatoes too, they rarely make it into the house. We probably eat a few dozen and day while standing out there! I love that Little Dude has his own tomato plants. There is nothing more rewarding than watching a plant grow and produce. I can't believe how big your tomato plants are, but I love them. This dish sounds like a great way to use up some of that zucchini. Thank you for sharing. I hope that you are not having as hot of weather as we are. It does make it extra special when you took a seed from plant to produce. Thank you! I love that I have everything I need to to make this dish right now! My garden is overflowing with both zucchini and tomatoes. Isn't that the best when you can make something without having to go to the store? I don't think I have seen tomato plants that big! WOW! Love the recipe and I am looking forward to trying it! This is a perfect recipe for all those amazing summer vegetables.YUM! I think so too, thanks! I love Zucchini and tomatoes. The flavors you have blended are so good, simple and delicious! I could much on these all day! I could too, they were so tasty. Thanks! I'm loving all those colors!! And I'm always looking for a good side dish to make with squash. 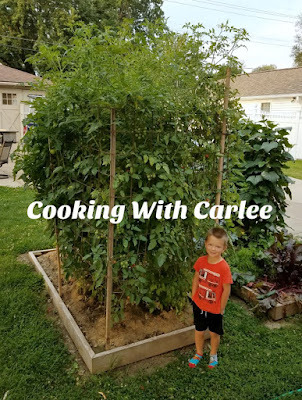 This is a great garden to table recipe that we will really enjoy! Hope you are having a great week and thanks so much for sharing with us at Full Plate Thursday. It really is a good and simple way to enjoy those garden veggies! Hi Carlee, your tomato plants are monsters!. I'm worried they are going to try to take over the world!... Our tomatoes and cucumbers are coming to an end now, they never seem to last past August, it's just too hot I think... At the moment corgettes are in a bundance in the supermarket and I still have cherry tomatoes on the plants. Anything covered inmelted cheese is a winner in this house. They are definitely trying to take over the world! My husband trims them and the cucumber plants every week or two to keep them in their designated areas! This looks delicious! We didn't plant any squash plants at all this year, and I am missing them so much. We had some kind of squash "bug" going on, so hopefully next year the plants will be happier. Speaking of plants... your tomatoes!! They are HUGE!! We had an squash bug infestation a few years back and that made us a little shy to plant more. Luckily we tend to get plenty gifted to us. We did dip our toes back in the water this year with cucumbers and so far so good.